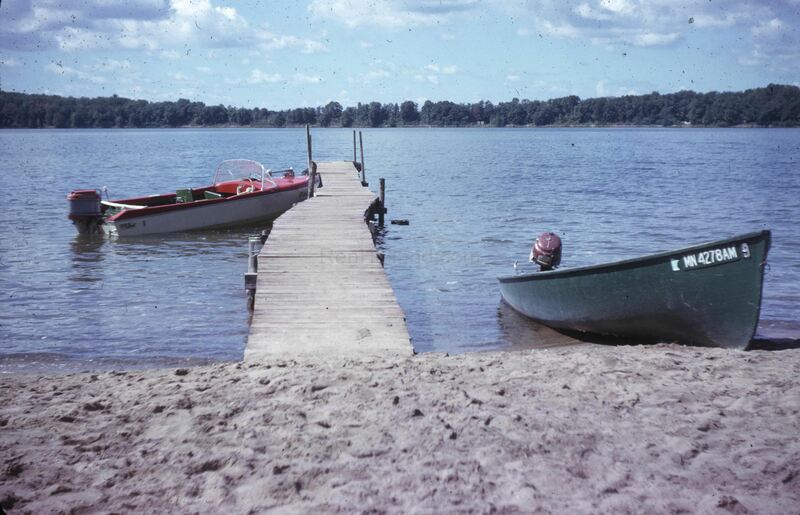 I want to thank Tim Donohue for sending photos taken at Big Whitefish Bay Resort during the summers of 1963-64, when he was a young boy. Tim’s sister, Jane, worked at the resort and they both share fond memories and images of the resort and the people they met. It was operated at that time by Audrey Ternus (1908-1991). Tim has also included a detailed description of the resort. One of Tim’s memories describe a man in an old wooden inboard who delivered mail and gave free rides to kids along his route. Although Tim may not have known it at the time, this would have been the legendary mailman, Ben Knebel, who delivered mail to Whitefish Lake residents from 1930 to 1969. If you look at Figure H, you will see the mailboat docked at Big Whitefish Bay in 1963. 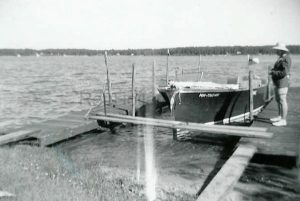 In 1992, over twenty years after Ben died, his 1949 mahogany 22 foot Chris Craft Sportsman boat was discovered after a long search. It was extremely deteriorated, but with personal affection, it was meticulously restored by two Whitefish Lake Resorters, Joe Ruttger and Ron Schultz. I have not seen this historic boat, but look forward to finding it next summer. Information may be available at the Crosslake Historical Society. We can all appreciate that Tim and Jane donated these photos and information, which give us a historic glimpse of Big Whitefish Bay Resort and Ben Knebel’s cherished mailboat. To read Tim’s writeup and view all of Tim and Jane’s donated photos, click here. This entry was posted in All blog entries and tagged Big Whitefish Bay Resort, Pequot Lakes. Bookmark the permalink. I have noticed you don’t have a resort called Frazer Bay Lodge on you list, it was on Lake Vermillion between about 1942 to the late 50’s. It was owned by my granfather Albert Anderson. Have many pictures of it.